The idea of start the company which deals with fishing expeditions and guiding was born in 2015. The factors that have pushed us to this business was progressing market of fishing tourism in Poland. We also want to raise the level of this kind of services in southern Poland. 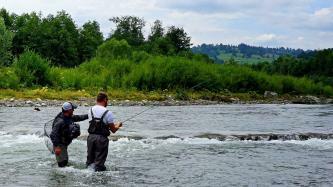 Tatra Fly Fishing at first place puts on quality of our services which aren’t depart of worlds admitted standards. We will make sure that our guests will be satisfied and the time they spends by the river with our guides will be used in 100%. 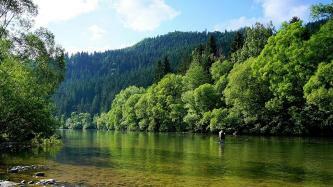 Fly fishing experience at best Slovakian rivers and lakes for beautiful rainbows, brown trouts and graylings. This offer we dedicate mainly for anglers who got any experience in fly fishing. Why? Because Slovakian rivers are full of fish... but they're not easy to catch ( if you are first-timer check this trip: https://fish.travel/charters/161 ). Slovakian catch & release sectors are known for huge rainbow and brown trouts. Normal size is 40-50 cm but there's a chance to meet the fish over 70 cm long! Beautiful fishing spots, exemplary guide service and landscape of Tatra mountains in the background guarantee perfectly spent day! Price includes: - professional fishing guide service - full equipment rental - fishing license - transport during fishing trip - photo report Rivers Vah, Poprad, Orava its tributaries and mountain lakes are waiting for you!